It was only a few days ago that I reported that Simon Gibson at Worth Avenue Yachts had signed the 35.4m motor yacht Cinque Star for sale, and now Simon tells me she has had a €1 million+ price cut, indicating the owner's eagerness to sell. Part of Azimut's popular 116 series, she is in immaculate condition having been used relatively little since her delivery last year. She has an interior by Carlo Galeazzi, and can accommodate up to 12 guests in five staterooms, with berths for five crew. Twin 2434hp MTU engines give her a cruising speed of 25 knots. 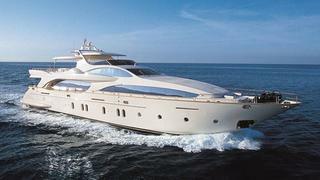 Cinque Star is now asking €7.9 million, down from €8.95 million, and is on display at the Cannes Boat Show this week.